First off a quick apology to say sorry about my blog silence for the last week or so. I've been trying to get a job somewhere near finished before Christmas, I've been doing some late nights and I'm looking forward to having a bit of time off over Christmas. Last week I met up with Kirsty for one of my last play dates as a stay-at-home-dad. Before I went I emptied the freezer and grabbed all the berries taking up space. We decided to have another preserving day and see what we could make with four kids running around. I think we did pretty well, we made red onion chutney, black currant jam, gooseberry jam and red currant jam. 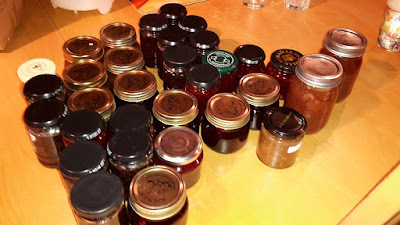 In total we made 32 jars and canned some in mason jars so it will last even longer. Divvying up at the end I felt really proud of food we'd created that will last for a long time. 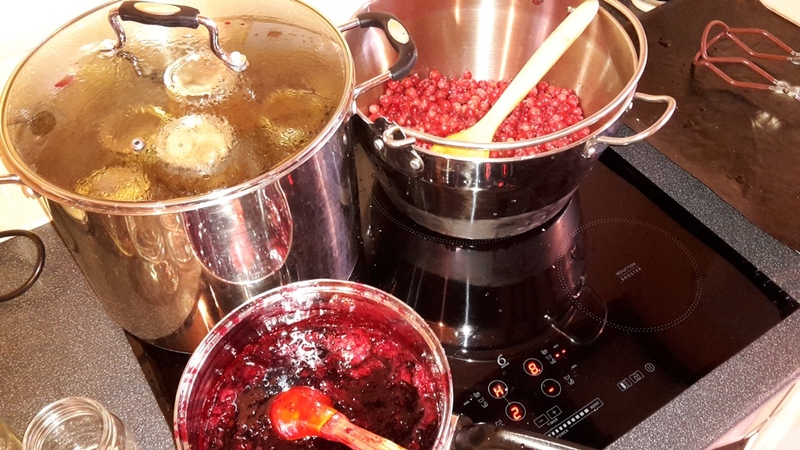 I'm really getting into the whole canning thing now and I'm looking forward to canning lots next year, I think a pressure canner will have to be on the cards at some point! It's so satisfying, isn't it. I look in my store cupboard at all the Paté, Pickles, Tomato products, etc, and it makes it all worth while. Well done! You have been wonderful as a stay at home Dad, indeed more hands on than some stay at home mum's. You have impressed me greatly, with all that you have attempted and achieved. Excellent Kev, well done. Yes,sounds like a pressure canner will be coming your way, maybe even a xmas pressie? Anyway, a very happy xmas to all of you and a great new year too. Good luck to Mrs A with the forthcoming delivery too, hope it all goes to plan...get some sleep now whilst you can! What a lovely selection of beautiful jars. The red onion chutney sounds really good. Do you have a recipe to share? These preserves comes very handy this season. Something that family members can enjoy over Christmas dinner, unlike the preserve recipes via Resumeedge review which are not that delicious.